The mythological creature seen in all of these tattoos is known for sneaking into people’s bedrooms and devouring bad dreams. 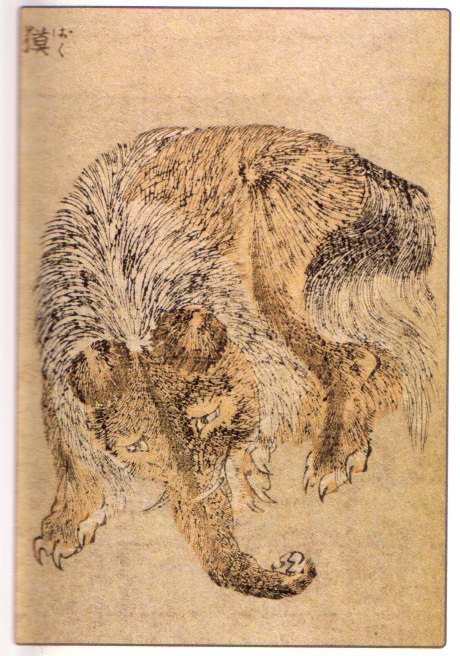 If you’re the sort of person who suffers from nightmares, night terrors, or, worse, sleep paralysis, there’s really only one motif from traditional Japanese tattoos for you — the baku. This chimeric mythological creature is known as an eater of dreams, and has been called upon by light-sleepers in Japan for centuries to help them slumber soundly. It’s thought that they’re based on tapirs, but the uncanny abilities of the baku set it apart from the real-life quadruped. If you’re lucky and this elephantine beast creeps into your bedroom, you may as well have popped a handful of Ambien, because you’ll be out like a proverbial light while it snorts up your overactive subconscious through its trunk. A baku’s supernatural services aren’t pro bono; you have to entice it to get rid you of your dreams. Back in the Edo period (1603-1868), it became common practice to place illustrations of baku under pillows, almost like teeth for the Tooth Fairy, in hopes that it will attract the nightmare-vacuuming yokai. According to legend, whenever a person wakes to find the baku next to their bedside, it’s customary to beckon to it, saying, “Oh Baku, devour my evil dream.” If the creature takes pity on the individual, it will eat the dream, converting it from a source of vexation into one of good fortune. Though the baku performs a kind service for people, its job isn’t by any means a pleasant occupation. Bad dreams taste bad, too. It is said that, seeing people writhe in their sleep, the gods fashioned the baku out of leftover parts of other animals, hence its patchwork appearance, featuring the tusked head of an elephant, eyes like a rhinoceros, an ox’s tail, reptilian belly, and tiger claws. Some depictions of the baku, like in Hokusai’s prints, bring out their twisted creation myth, portraying them in an almost Eeyore-ish light. In contemporary Irezumi, on the other hand, most baku are made to look intense, rivaling other mythological beasts like dragons and kappas in ferocity. Because baku descend from legends in China, they closely resemble shishi (or foo dogs as they are called in Japan), typically featuring spotted torsos and manes. If you look closely, you can see how each artist gives this devourer of dreams their own spin. Alessio Ricci and Mike Rubendall both give it a single, backward-facing horn like a kirin’s, for instance, while some — Chris O’Donnell, Johan Svahn, Marius Meyer, and others — surround it with their favorite elements, like lightning, fire, maple leaves, and even blood to give it a signature touch. Regardless of the different ways they stylize the baku, each of these tattoos would keep even the most terrifying of nightmares at bay. To see more traditional Japanese tattoos of mythological creatures, perhaps even a few more dream-eaters, follow all of these Irezumi artists on Instagram. If you want your very own tattoo of a baku to ward away nightmares, have one of them design one of the chimeras for you. This little foray into the stuff of nightmare was Indomitable, our series where we explore the history and symbolism behind motifs in traditional Japanese tattoos. We hope you liked learning about this ancient tranquilizer, the Baku, but if it didn’t satisfy your appetite for Irezumi, check out our previous posts about cherry blossoms, hannya masks, kitsune, peonies, phoenixes, the Nue, samurai crabs, severed heads, and tofu boys.